August 22, 2012 By arzea 30 Comments This post may contain affiliate links. Read my disclosure policy. Let me first say, I love fall. I love when the leaves start changing colors, the humidity starts to break down, a light breeze comes into the air and the temperatures drop slightly. I love thinking about fall bonfires, hoodie sweatshirts, and spiced apple cider. Pumpkin patches, hay rides, and picking apples all come to mind when I think about fall. College football, tailgating, wearing pants, long sleeves, and hats! 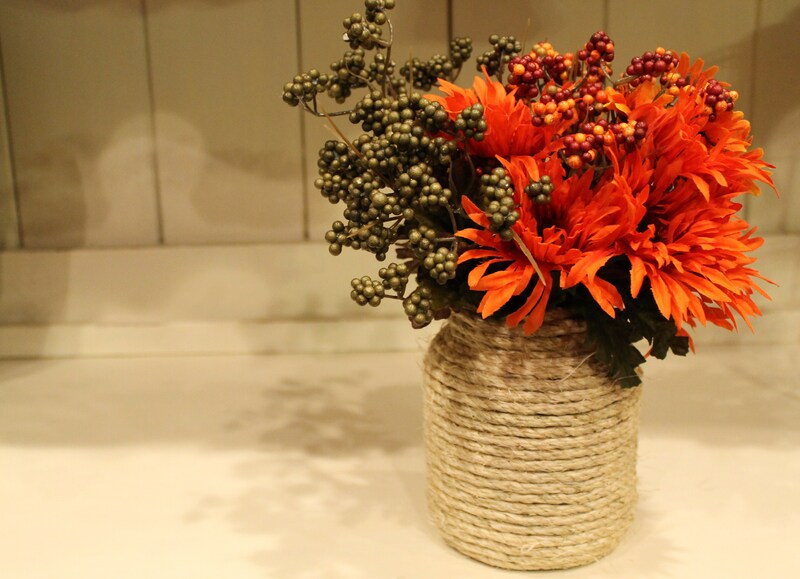 Fall decor is so beautiful, too; Orange, red, yellow leaves, pine cones, wood baskets, mini pumpkins and gourds….so many cute things! I have been noticing lots of fall inspired crafts on pinterest and decided to take on one of my own. I recently finished a big hutch for the kitchen (post to come soon), and I need cute things to help style it. I found a couple little vases/bowls at the dollar store and thought they would be perfect to decorate. 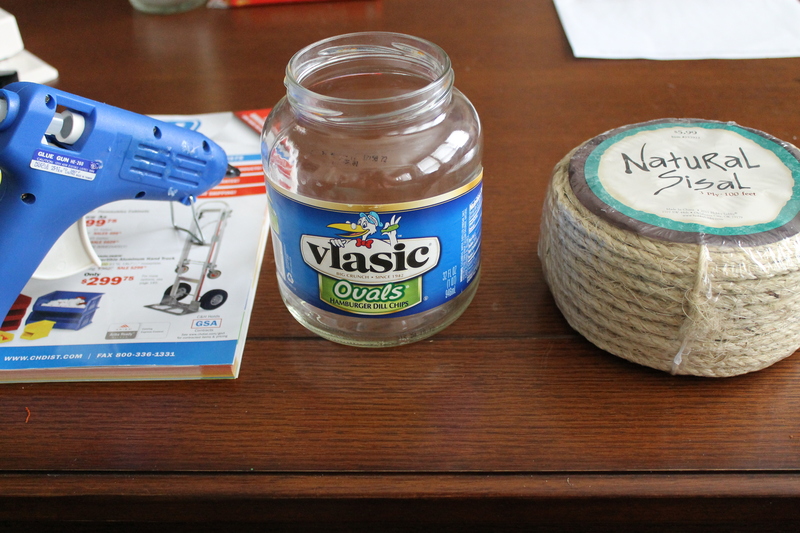 Then, while I was putting away some recyclables I noticed a glass pickle jar that would be perfect for my project. I cleaned that baby out and got to work…. 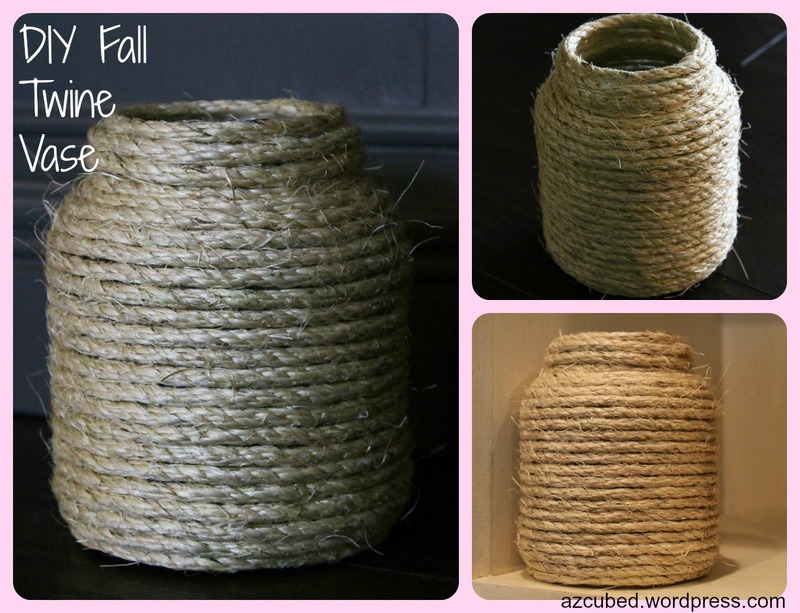 You will need: Some sort of glass jar/bowl/vase, twine (I used natural sisal**), hot glue gun, and hot glue. 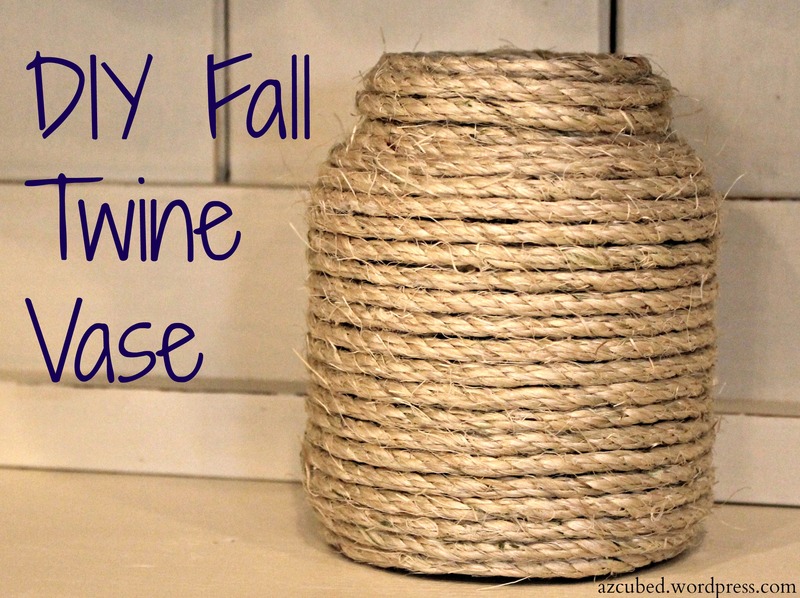 **I found this 100ft pack of twine at Hobby Lobby for $5.99, but you can print a 40% off coupon making it around $3.50! Start by gluing a piece at the top on the inside a little bit, and then start wrapping and gluing around the jar. I did a little at a time because I found that I had to press the twine against the jar for a moment so that it would stick and not just pop back off. 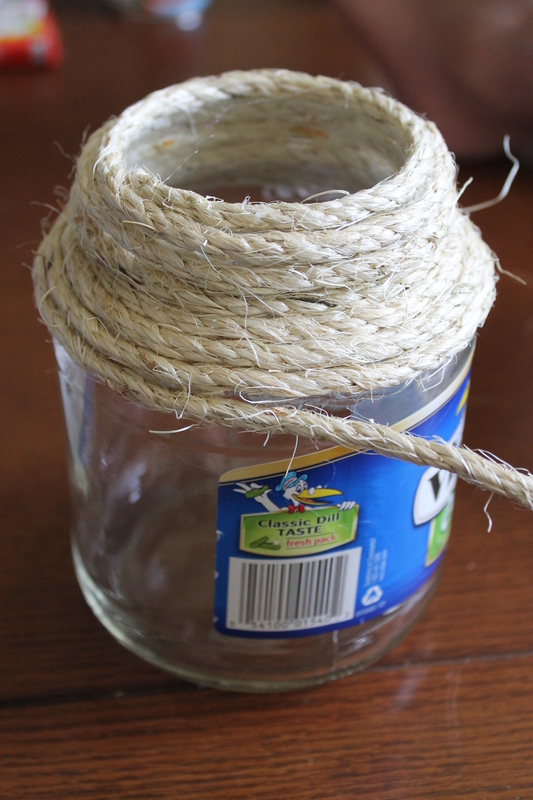 I put the glue on the jar, and then pressed the twine into it. I just stopped after the lip curved in at the bottom. Cut twine and secure last bit with a lot of glue! Voila! I didn’t buy any fall leaf/flowers to put into the vase yet, so I found these (maybe poisonous?!) berry leaves that looked so cool in the backyard! 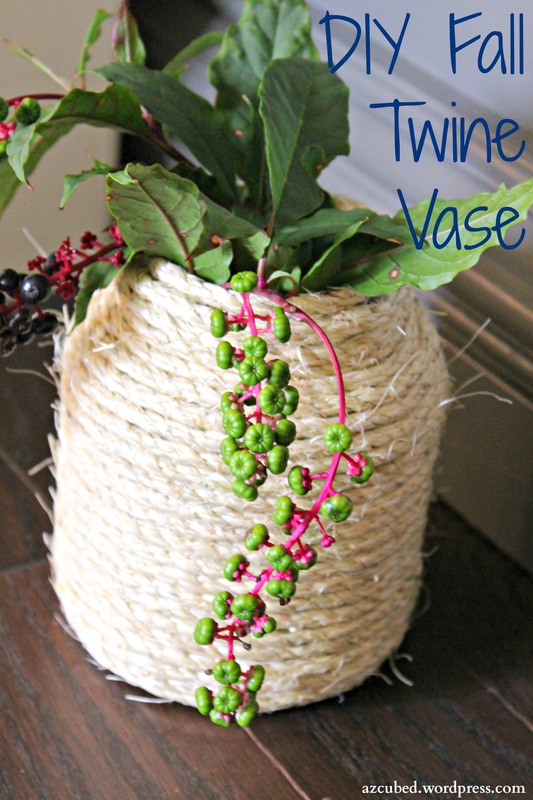 I have lots of extra twine left over so I am thinking up some projects that I can use that on, too!! I think this could even be cute just putting the twin on one section of the glass…like in the middle, or the base! This was such a cheap and easy project to do. Probably under $3 total! « Veggie Cooking Cheat Sheet! I love this! I’m pretty sure my husband has some twine lying around so I will have to try it. Looks like this brought out your inner Martha Stewart!! LOL! Love that the pickle jar is so much better looking as a vase. Cute stuff! This is really cute! Would be perfect to hold a few flowers in summer! Thank you! Yes, it would be! I love it for fall, you you are totally right about it being summery as well! These jars look great! I’m definitely going to give it a try – Thanks for the idea! Thank you!! They were so cheap and easy! Let me know how they turn out! What a fantastic use of old jars! These would also make really great candle holders. Definitely adding this to my list of things to try! Wow, thank you so much, Carissa!! I am going to check it out now! Very cool! I did this on my blog then thought to google it and see what others came up with. I like this because it looks like you could use that an herb planter. I love your idea to use the pickle jar, who doesn’t have one or two about to be empty? Your berries? Yea they are poke berries and poisonous. Love this way. Tried rope with bottle project last week. Gonna make a new one. Thanks for sharing!